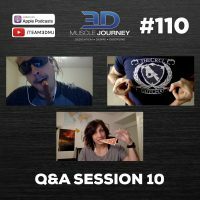 In this episode, Eric, Alberto, and Andrea answer seven questions sourced from the 3DMJ community. The questions addressed during this episode span a wide range of topics, including: the coaches’ thoughts on using anger to fuel your training, advice for how to coordinate one’s training with a busy work week, what it means to “lose momentum” during a gaining phase, and many more. In addition to the above topics, the coaches spend nearly one third of the episode talking in-depth about the negative effects that can arise from tracking one’s food intake. The coaches discuss when tracking is appropriate and alternative methods for when it is not. Whether you are a coach, competitor, or noncompetitor, this episode contains practical information you can use to improve your, or your clients, strength and physique. 10:51- Are leverages always better at a higher body weight? The ‘Health at every size’ approach isn’t advocating that an individual can be healthy at any weight but rather that each individual will have a weight range that is most healthy for them, which may not fall within the BMI ‘normal’ range. On a slightly different note, in terms of the relationship between tracking and disordered eating being tricky to determine directionality, I thought I’d add in a note about the literature on women with diabetes who have a higher rate of eating disorders and disordered eating than those without diabetes. As diabetes self-care involves counting carbs in order to determine amount of insulin, often limiting sugars, planning food intake in advance etc, this would suggest that these behaviours directly contribute to a higher risk of disordered eating and eating disorders. Of course, other factors might explain the relationship between the two but I’ve not yet seen any evidence of a common genetic link, for example. Including this evidence, I would suggest that tracking does increase the risk of disordered eating. Emma, thank you so much for your comment! I 100% get behind the representation of the HAES position you presented. If that is the current claim, I agree! I am overweight as classified by BMI as are most athletes! It could be that the HAES position has evolved, but I have seen the specific claim that being overweight or obese is not an independent risk factor for any disease state or adverse clinical outcome. This is in the “HAES manifesto” downloadable from their website which is from Linda Bacon’s 2010 book, so it’s possible that this is not an accurate representation of current views in 2018. The science is evolving, but there is a fair amount of data suggesting that while a person with obesity can certainly get much healthier if they exercise, eat a healthier diet, and present as metabolically healthy, there is mixed data that this eliminates any increased risk of all cause mortality or negative clinical outcome. So I think that statement is too strong based on my non-expert (I’m not an obesity researcher) understanding of the literature. Of course I’m open to being wrong. That said, I do love the aspects of self love, acceptance, and focusing on the process of treating yourself well with healthy eating and exercise, and learning to be better in tune with hunger and satiety (although this is physiologically dysregulated in some individuals with obesity) vs an all encompassing focus on weight loss at any cost. Indeed I think there is merit in serious consideration of HAES approaches as an intervention and like you presented, there is data to support that notion. With that said, I don’t think any and all attempts to lose body fat – which include some aspects of traditional weight loss approaches – are inherently negative, harmful or doomed to fail, as I’ve seen stated. However, not including some strategies borrowed from intuitive eating (ensuring use or maintenance or a return to internal cues) and counselling self acceptance and love I think misses out on critical aspects of what we currently know to be effective. And I wholeheartedly agree that I think in many cases tracking and weighing, especially continuously as a way of life can be harmful and can increase risks of developing eating disorders in certain individuals (but not all). Indeed, among college students with eating disorders, 75% use MyFitnessPal and of those who do use MFP, 73% perceive that using it contributes to their eating disorder https://www.ncbi.nlm.nih.gov/pubmed/28843591. How you interpret this is important though…does that mean tracking should be avoided altogether, or in individuals with an eating disorder? Or something in between. Regardless we should be cautious of how we use tracking and if/when/how/how much we recommend it’s use as fitness professionals. So we’re on the same page! First of all I want to say thank you for all the amazing content the 3DMJ team produces. 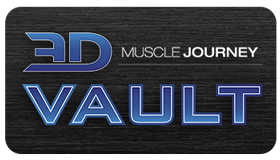 I’ve learned a tremendous amount from both The Muscle and Strength Pyramid ebook and the Lifting Library video course. whose objective is to MINIMIZE INJURY RISK over a lifetime of strength training? In this example please assume the client is gen pop and just wants to build muscle, lose fat and look great. They are not planning to compete in bodybuilding, powerlifting, Olympic lifting, etc. We’ll definitely add your question to our bank for consideration in future episodes…Appreciate you taking the time to write in!